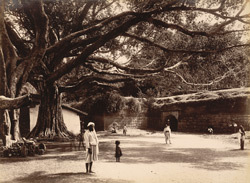 View of the Sally Port, Srirangapatnam from the Lee-Warner Collection: 'Souvenirs of Kolhapur. Installation of H.H. the Maharajah, 1894' taken in the 1890s by an unknown photographer. The ‘Sally Port’ is an inner rampart of the fortress at Seringapatam (modern Srirangapatnam) where Tipu Sultan (1753 -1799), the Raja of Mysore was killed, 4 May 1799. In fighting against the British, Tipu’s final defence was to retreat to the heavily fortified citadel here, however British forces reached the island city and stormed the fortress by breaching the heavily fortified walls. The subsequent defeat of Tipu and his forces made the British East India Company the paramount power in India.